When a young man is diagnosed with a debilitating autoimmune disease with no cure, he and his father go on a journey to find answers and hope. ​From England to Iowa, Embry encounters other MS-sufferers who share their own information and question if neurologists, Big Pharma, academia, government and multiple sclerosis charities are keeping MS patients from accessing alternative treatments for the sake of profit and greed. 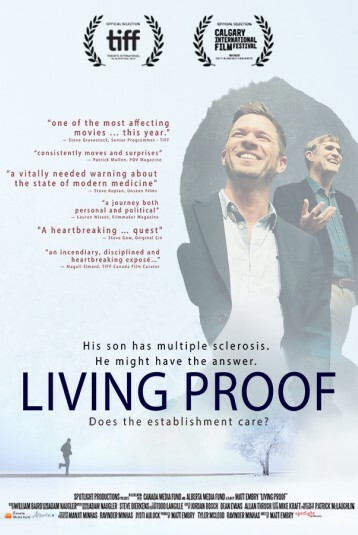 In the vein of Roger and Me and League of Denial, Living Proof stylistically blends first-person investigative filmmaking, hard science and a compelling, heartfelt story of a father and son’s fight to discover the truth and save lives.